October 31, 2013 - On Wednesday the Air Force released its findings on the crash of an F-16 that crashed near Cervia, Italy on January 28, 2013 that killed 32 year old Major Lucas "Gaza" Gruenther after he ejected from the aircraft. On 28 January 28 at or about 7 PM, Major Gruenther a pilot with 510th Fighter Squadron, 31st Fighter Wing departed Aviano Air Base, Italy in his F-16 (tail umber 88-0510) with two other F-16’s as part of a formation for a night training mission. 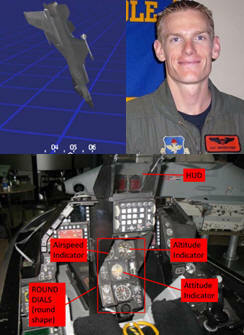 The pilots were simulated two bomb attacks while using night vision goggles (NVGs). The first attack, which did not include any simulated defensive threat reactions, was executed without any problems. On the second bomb attack Major Gruenther executed a threat reaction which culminated in a “last ditch” defensive maneuver. While performing defensive maneuvers Major Gruenther entering a 45 degree nose low, 90 degree left wing down, attitude, within moments of theses maneuvers the Major reported he was felling spatially disoriented, a condition in which a pilot has the inability to correctly interpret aircraft’s attitude, altitude or airspeed, in relation to the Earth or a point of reference. Gruenther’s wing man instructed him to turn to his aircraft instruments to combat his disorientation and to recover from his low nose pitch and angle of bank. Inside the cockpit aural warnings and caution lights illuminated inside the aircraft. Gruenther’s disorientation overcame him, he believed he could not recover so he ejected from the aircraft. Gruenther’s plane crashed in the Adriatic Sea and he died from head and neck trauma during ejection his body was located three days later. At the time of the mishap, the major had 2,341.2 total flight hours, including 149.7 NVG hours and 414.8 combat hours. His peers considered him a very good pilot and an outstanding officer. His Squadron Commander rated him in the top 10% of squadron officers and in the top 25% of squadron pilots. The aircraft was valued at $28,396,157.42. In the final report Derek Rydholm, Brigadier General, USAFR President, Accident Investigation Board wrote - I find, by clear and convincing evidence, that the cause of the mishap was the Major’s failure to effectively recover from spatial disorientation, due to a combination of weather conditions, the Major’s use of night vision goggles, the aircraft’s attitude and high rate of speed, and the Major’s breakdown in visual scan.